Two young germans sit across from me, sucking back bavarian lager like its a juicy bratwurst. 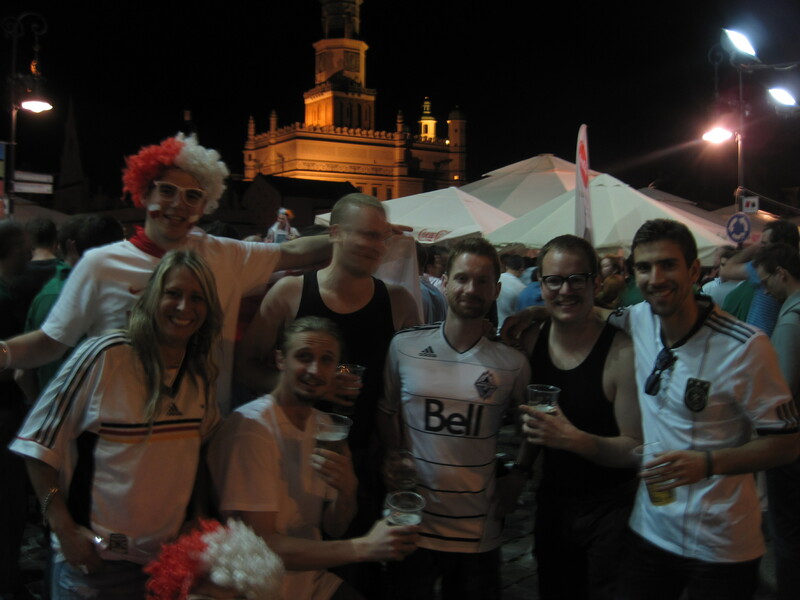 The train ride from Berlin to Warsaw gives me some time to reflect on the Vancouver hockey riot of 2011, and the possibility of similar unrest at the European Soccer Championship. Just days before, Russian firms battled Polish hooligans at my destination, and I’m wondering if another war reenactment is in the cards. I have tickets to see Russia playing Greece tonight while the Polish National team also plays for survival. With both teams getting blitzkrieged, the atmosphere is sadder than old yeller’s death scene. We don’t linger long and b-line for Poznan, where we’re sure to find some craic. Our crew somehow resembles a group of germans and the crowds flood us with congratulations from our apparent win today. Not ones to miss opportunity, we start a chant using the only German words we know, “Flugen, Farby! Flugen, Farby! Flugen…” The crowd eats it up. A few wonder why on God’s green earth germans would be chanting the name of a Polish paint company. The attention doesn’t last, so we kick a ball around to stir up something. A posh Italian chests the ball from his crisp white shirt, to an irish fan in beer-soaked soccer gear. I see a social experiment in the making as the play turns sloppy, and the men become more aggressive. The game descends into chaos as irish fans, who have now overwhelmed the crowd, punt the ball as high into the air as they can manage in some butchered version of Gaelic football. Just as I am ready to sit back and watch a good ol’ riot break out, the ball drops lazily into the hands of our friend Agata. The ball’s dropping has the same effect on the game as Justin Bieber’s will on his singing career and we use the brutes confusion over an actual female being in their midst to make our escape with the ball. Later, we walk down one of the many narrow cobblestone streets surrounding the stary rynek. After a few too many Tatankas and ball in hand, we look at each other, and say, “f*** it”. Within a blink, Irish spring out of every nook and cranny. Instead of swimming against the tide, we join in. My gaelic football skills lack and I step aside. The first sign that events may slip out of control falls on my foot, as an errant boot knocks a sign down from above. The final boot, which would make Adrian Sweeney proud, sends the ball packing to the highest rooftop. It is now game day. The town centre statues covered by drunken football fans early in the a.m. are now covered with fencing and barbed wire (as if that ill stop them). I hop on the tram. 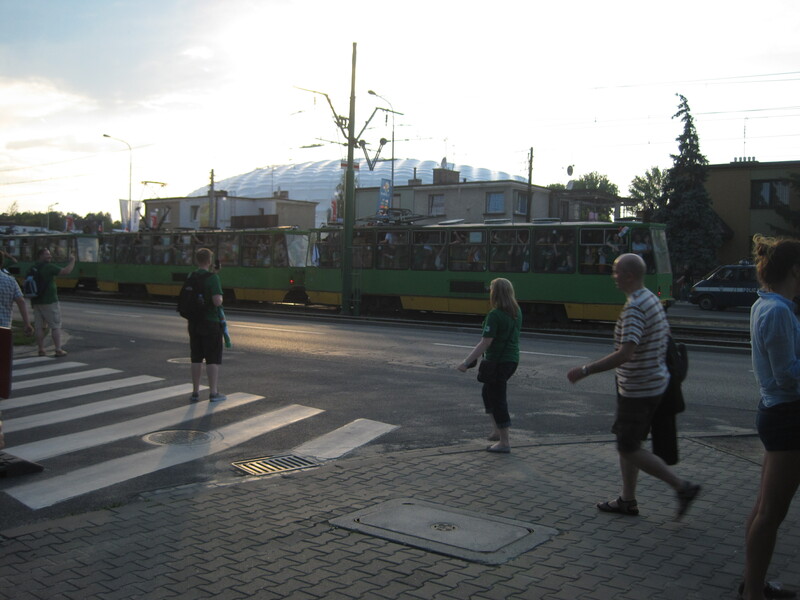 As we get closer to the stadium with every stop, the tram fills up with green like potato in a perogie. Approaching the stadium on foot, the crowd thickens. Female soccer fans make their first appearance, but only clad in blue. It appears the Italian fans, though drowned out by the Irish, manage to still draw plenty of attention by actually taking some of their women along with them. We buy some Tyskies from some Polish girls dishing beers out the back of a pizza delivery hatchback. Walking through the crowd with beers in hand, our news of pizza-delivery-beer-girls make the football fans slober. Knowing the stadium will be dry, the hatchback from heaven is an oasis in an arid desert. Entering the stadium, I note they serve 0.5% alcohol beer in the stadium. I figure I would need 100 beers to get me drunk at that percentage, but it doesn’t stop many of the faithful from trying. Walking back to our rented apartment I watch some Irish fans battle to ascend to the top of the some historic statues at 6 o’clock in the morning. I again think back to Vancouver’s hockey riot. The chaos that has engulfed the town lacks the outcome of June 15, 2011. While cracks in the cobblestones slowly gather glass from broken bottles, I see no burning police cars or joyous looting. I cannot fathom a reason why it doesn’t. For starters, these fans are clearly drunker than anyone I came across in Vancouver, save for the man I saw in the mirror. Secondly, Vancouver riot had women. Here, it’s all men. I smell more irish sausage than in an ulster fry. But maybe that’s just it. A few less women, a bit more beer, and we’d all be a lot more peaceful. At least that’s what I’m telling my girlfriend next time I head for the pub.